D Double E: "I've always wanted to give the people my album." 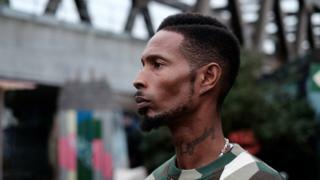 As one of grime's pre-eminent MCs, D Double E helped pioneer an entire culture.His roots go back to the era of garage and jungle, when the scene still didn't have a name. Along with the likes of Kano, Stormin and Ghetts, he was part of the Nasty Crew before forming the Newham Generals and signing to Dizzee Rascal's Dirtee Stank label.Skepta has called D Double E the "greatest of all time". Dizzee said he inspired him to start rapping. But his music has largely been confined to mixtapes, one-off singles and high-energy radio sets... Until now. Last Friday, the East Londoner finally released his debut album, named Jackuum after the term he coined meaning to "rewind" or "reload" a track. "Just time ticking is what made it happen," he says. "I'm 37 now. You can't wait forever. I don't want to be having my first album at 40. "In the past, he admits, he resisted the urge to go solo out of loyalty to his bandmates. "I was in a team situation, so that was my mindframe," he says. "So if I'd got a big call from Sony or Island Records and they'd wanted to sign me, I would tell them, 'I'm in a group with my people'. "That's why it's taken so long: I'm loyal and I care." Indeed, humour is a hallmark of his album - whether constructing a diss track out of EastEnders characters ("Dem man come like Ian Beale / Us man move like Grant and Phil") or revealing he used to body-pop while watching Top of the Pops. "I've been holding it down for years!" he laughs. "My signature move had to be the running man. And I could do that thing where you jump in the air then land on your hands, like a handstand, yeah? But then I'd come down like a snake and I'd spin around on my back and I'd flip up on the legs. It's just one surprise from a man who's more down-to-earth and quietly-spoken than you might expect from his musical persona. As he prepares to leave, he notes with disbelief that his face is plastered on a billboard 100 yards away from where we sit. "It's mad," he says. "I'm going to go there in a minute. I want to say a prayer underneath. "Jackuum is out now. » Is grime dead?Or has it 'just gone back underground'?